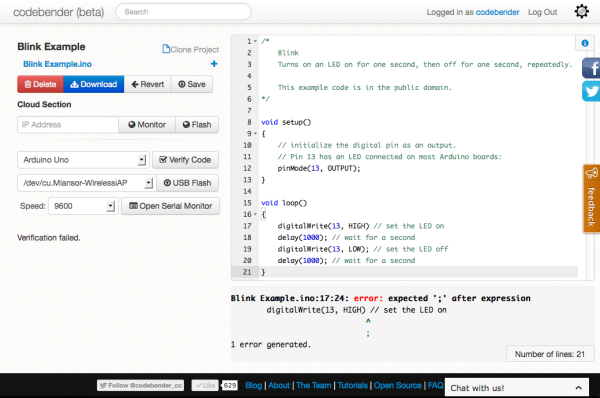 Codebender is a web-based programming tool for Arduino. ” Traditionally, you would need to install an IDE, which includes all the necessary software, find and install the correct drivers, set permissions, etc. It can take 10-60 minutes. Or it can be a total mess. Best of all, its open source. For more information or to start programming visit Codebender. This entry was posted on Thursday, September 19th, 2013 at 12:56 am	and is filed under Arduino, code, open source, site, tools. You can follow any responses to this entry through the RSS 2.0 feed. You can skip to the end and leave a response. Pinging is currently not allowed. Lot of online services interesting nowadays. And i think that one is missing in this list. Really 10 minutes to install Arduino? Takes all of 30 seconds. It takes longer to register (yes you have to register to use) on Codebender’s site then to install Arduino on a Windows Machine. They collect personal information (verified Email address), plus they require a browser plug-in (potential danger), no way to keep your work private, looks like a pain to upload libraries they don’t already have, no way I can see at first glance to set compile directives (but do Arduino Kiddies even get this?) Is this cloud app serving ads? Big issue is no simulator, or am I wrong here? Anyway – I don’t want to be a “downer”. This looks like a promising effort. I’ll keep an eye on it. I like the open-source aspect, allows community scrutiny; perhaps. Thanks for the post DP. You’re right on all those points. That said, everyone has your email address, it’s hardly private. The browser plug-in is just a chrome extension to enable serial. Your email probably isn’t private either, and even if you think it is, you’re 99.9% wrong given that you talk to other people using webmail. That is a tangent anyway. The cloud app could serve ads, true, they could also choose to charge for, say, >5 projects. But it’s open source, so if you like, spin up your own AWS instance and go to town. It sounds like you’re not generally too keen on cloud apps, which is fine. But for perspective, this sounds like the least objectionable cloud app I’ve seen in the last year, and I’ll be damned if I’m going to roll my own arduino network deployment solution. That’s just NEAT. Just connected to my Sparkfun RedBoard from my Chromebook in less than 5 minutes using Codebender. Works great and since I don’t have the option of installing the IDE locally, it’s probably what I’ll be using as I re-acquaint myself with Arduino. I think it’s great.